By : Ashok Handoo : If the Prime Minister Dr. Manmohan Singh has been saying it repeatedly that Naxalism is the biggest challenge to our internal security he clearly wants to underline the dangers it has been posing to India, as also the need to deal with the challenge in a most effective way. Naxalism, which started from Naxalbari area in West Bengal in 1967, ostensibly to champion the cause of small farmers and tribals through violence, was wiped out in 1970. It soon became out of fashion in its homeland West Bengal. But the underground operations of the outfit continued. The problem became more serious after the merger of the Peoples War Group (PWG) and the Maoist Communist Centre (MCC) in September, 2004 which led to the formation of the CPI (Maoist). Naxalism today holds sway in vast swathes of 10 states in the country, involving about 180 districts. Only last week, the Home Minister said in the Parliament that Naxal challenge had been underestimated over the years as a result of which left wing extremism had increased its area of influence. The Home Minster said that they now pose a very grave challenge to the state. Just days before his statement 36 policemen, including an SP, had been ambushed by the Maoists in Chhatisgarh. It was in this backdrop Mr. Chidambaram urged the Members of Parliament to join hands in facing the challenge. “All sections of the house must recognize that if we must remain a democratic, republic ruled by law, we must collectively rise and face the challenge of left wing extremism” Shri Chidambaram said. In its status report presented to the Parliament on March 13, 2006, the then Home Minister Mr. Shivraj Patil said that the Naxalite movement continues to persist in terms of spatial spread and intensity of violence. He pointed out that it remains an “area of serious concern”. 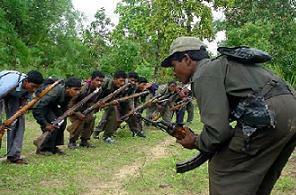 Naxal violence has claimed about 6000 lives during the last 20 years. The question that arises is why have the Naxals been able to extend their area of influence over the years to become a serious threat to the country’s internal security? It is encouraging to know that the government is not treating it as a mere law and order problem. The 2006 status report itself made it clear that the Government would address the problem in a holistic manner. That includes ‘political security, development and public perception management fronts’ as well. Surely, the Naxal problem is deeply rooted in the social and economic disparities in remote and tribal areas. Since the fruits of development have not percolated to these areas, the Naxal outfits are able to exploit the sentiments of the local people. But the outfits themselves have been preventing and in fact destroying, developmental initiatives taken by the government. They destroy roads, railway infrastructure and administrative institutions that are needed for speeding up developmental activities. Not only this, they indulge in train hold-ups, jail breaks and attacks on politicians. That is proof enough to indicate that they do not have real interest in the development of these areas and their loyalties lie elsewhere. Perhaps, they want to usurp political power which, they think, flows through the barrel of the gun. At the same time, a lot many measures need to be taken to make the fight against Naxalism effective. On top of this is improving governance in the affected areas by moving corrupt officials who exploit the local people. It must also be ensured that large scale projects in these areas do not lead to displacement of people, who in any case, live a life of penury. Since law and order is a state subject, the role of State Governments in dealing with the problem can hardly be overemphasized. They too have their share of responsibility to fulfil. A good deal of coordination between the Centre and the States is, therefore, called for. This is particularly true in view of the fact that the Outfits have established inter-state networks. The state police need to be modernized to be able to tackle the Naxal attacks. The Greyhounds experiment in Andhra Pradesh is a case in sight. Actionable intelligence collection and sharing mechanisms need to be strengthened. Funds provided to the States under the Police Modernization Scheme need to be better utilized. The states also need to go fast with raising India Reserve Battalions, particularly in Naxal affected areas, which besides addressing security concerns, provide jobs to the unemployed youth. A specially trained police force also needs to be put in place to fight the Maoists who basically are adopting guerrilla warfare techniques. There is also a difference in their targets. While other terrorist groups attack the strong foundations of the country such as democracy, secularism and the financial institutions, Maoists make India’s weak points like poverty and economic disparity as their targets. All this needs to be factored in the strategy to deal with the Maoist problem. Keeping in view the fact that the Naxal groups have been raising mainly land and livelihood issues, it is important that land reforms are taken up on a priority basis. States have also to focus on physical infrastructure like roads, buildings, bridges, railway lines, communications and power etc. There is no room to brook any delay on this account. Unfortunately, the several rounds of talks held with the Naxals hitherto and the announcements of amnesties and attractive rehabilitation schemes have not worked so far. Some states like Andhra Pradesh have a good rehabilitation policy and it has achieved some success, but a lot more remains to be done. The Government indeed is committed to address the Naxal problem in right earnest. It is focusing on improving intelligence set up at the state level, providing help to the states to modernize and train their police forces and accelerate development in the affected areas. What is needed is better coordination both on security and developmental fronts to meet the challenge posed by the Naxals. indeed naxlism is serious threat to ourintenal security.it is the result of poverty,unemployment,and exploitation being done by corrupt officials.